Are you avoiding a key BricsCAD performance tool? Are you a BricsCAD user who favors using menus over using the keyboard for command input? If you are, you might want to reconsider. You need to know that the most often used commands in BricsCAD have fast keyboard equivalents. These keyboard shortcuts can be a great performance enhancer, especially when toggling settings. To help you get started using them, we’ve created a map of BricsCAD’s keyboard shortcuts. Your computer’s keyboard is sitting right in front of you – don’t ignore it! Using BricsCAD keyboard shortcuts can boost your productivity over using menus alone. You can do things much faster with keyboard shortcuts then you can by clicking through multiple menu panels. Don’t waste any more of your precious time – get to know the time-saving BricsCAD keyboard shortcuts. At Bricsys, we’re all about speeding your CAD workflow. An easy-to-print PDF version of the BricsCAD keyboard shortcut map is available here. It is great this blog post was written. Modern day CAD users seem to have forgotten about keyboard shortcuts which was a first for old generation CAD drafters to learn. 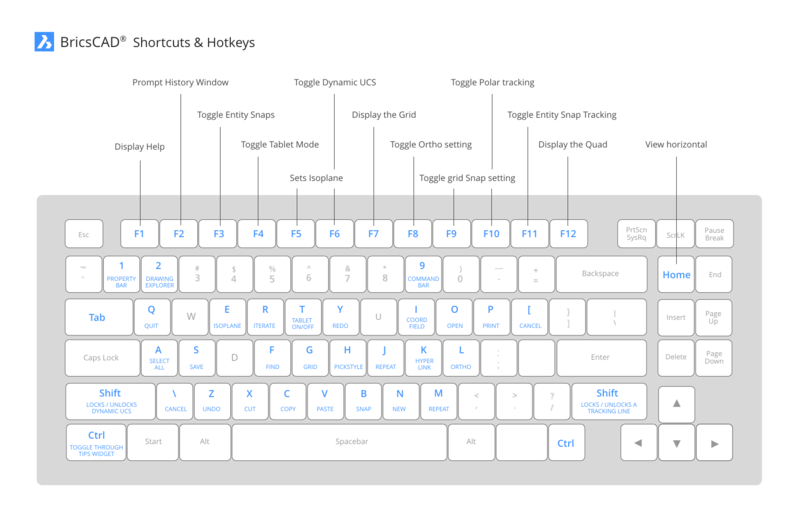 It is impossible to remember all the key shortcuts but if you require to do some repetitive tasks, please do remember to come and check out this guide. It can save you significant time and energy and make working in CAD a joy. Thanks for your comment Rakesh. We hope that this shortcut guide will help our BricsCAD users and improves their workflow! Thank you for this post and PDF. I have long preferred key board short cuts to pull down menus. It’s great to have a succinct description of “hot keys.” I’m new to BricsCAD, having be out of CAD for some time, and now a confirmed BricsCAD user. Though I have no experience with Catia, Pro-E and the like, I can say that dependency on pull down menus only slows down my work flow. I save “time and distance” by using key board short cuts. Keyboard shortcuts are great. I don’t have any use for the Toggle Tablet F4 key shortcut and I like to make F4 be Toggle Ortho instead of F8. I use SharpKeys in Windows 8 to switch them, but it would be nice if it was easier to remap all keys within BricsCAD. I did try an override for F4 and it worked but was too slow. Is it possible to use SHIFT+Letters to bind actions? In AutoCAD I used that a lot since I still want to keep the standard ones with CTRL.